Joyce Ardell Clifford of Granite Bay passed away peacefully to be with her Lord on March 15, 2018. She was born in 1932 to Frances and Rev. Wilbur Sanders, who built the Methodist Church of North Sacramento in 1939. It was at that church that she met the love of her life, Dr. Robert E. Clifford, and after a few years together, they were married. Together they had four children, Sondra, Robert B., Steven, and Michael. 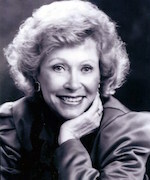 Joyce was a graduate of Grant Union High School and a Sierra Chapter Charter Member. She was an accomplished theater organist, who studied with Richard Purvis and George Wright, and she transcribed many of Wright's theatre organ arrangements. She performed multiple concerts at Grant Union High School, including the 1999 George Wright Memorial Concert. Her husband predeceased her after 56 years of marriage, and she is survived by her four children, 11 grandchildren, and many nieces and nephews. Family and friends are invited to a Celebration of Life on Wednesday, March 28 at 11:00am at The Lutheran Church of the Resurrection, 6365 Douglas Blvd, in Granite Bay. Arrangements under the care of Lombard Funeral Home.